These days, when you think of mySociety’s major projects, you’d be forgiven for passing over the vision in purple that is Pledgebank. And yet, it’s among mySociety’s longest-running sites, and one that we had big plans for. It was a truly international project, too, with users in many countries. It even, as we’ll see, spawned one of the UK’s major transparency organisations. But all good things come to an end, and as we announced in a recent post, we’ll shortly be closing Pledgebank down. Before we do, it seems a good moment to record some of its history. The purpose of PledgeBank is to get people past a barrier which strikes down endless good plans before they can are carried out – the fear of acting alone. It allows anyone to say “I’ll do X if other people also do X”, for example “I’ll write to my councillor if 5 other people on my street do the same”. However, there is no scale to big or too small, it could equally be used to say “I’ll start recycling if 10,000 other people in Britain also start”. 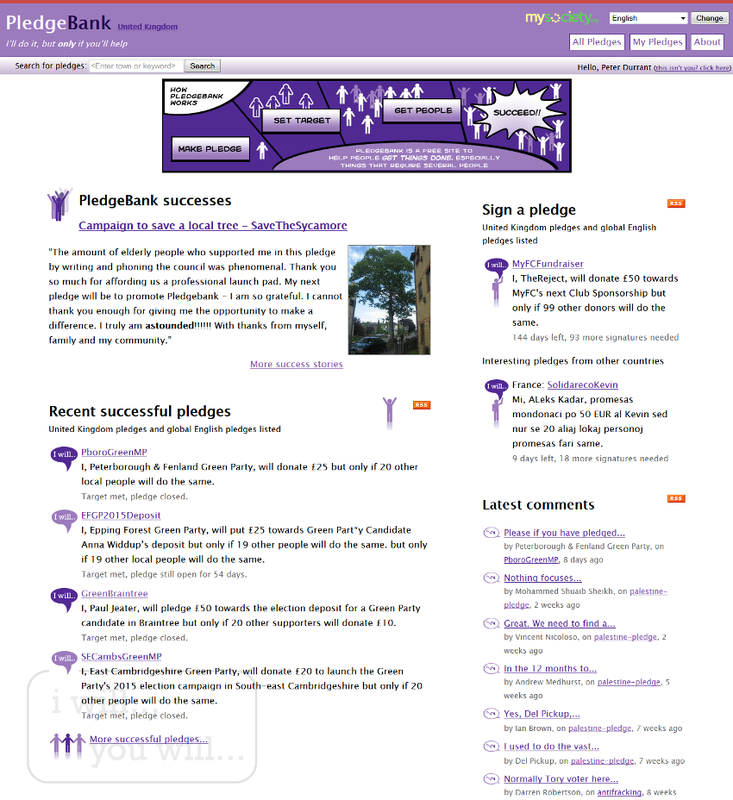 Pledgebank officially launched on 13 June 2005. We’d opened a trial version of the site to a few users first, with early pledges including anti-ID card campaigning, carbon offsetting, and community river cleaning. People were interested. It was off to a good start. As the Guardian reported, even Brian Eno was a user. By that September, mySociety Director Tom was describing Pledgebank as our most popular site yet, and as of January 2006, there had been more than 200 successful pledges. 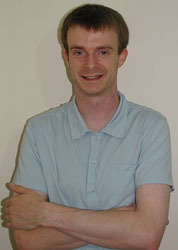 In July 2006 the site won the New Statesman New Media award. So that was all going swimmingly, and as time passed, we started building on the basic Pledgebank model. 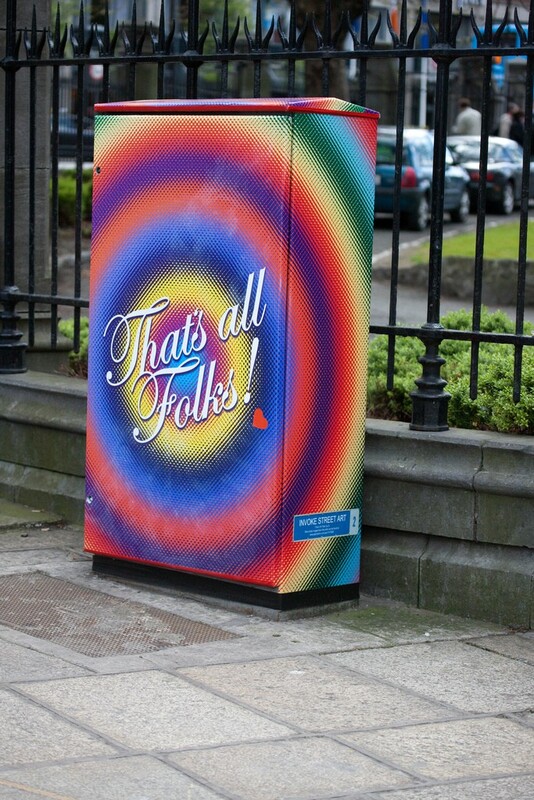 There were location-specific Pledgebanks, like Pledgebank London which urged folk to do a good deed for their city. Both the then PM Tony Blair and Mayor of London Ken Livingstone helped launch it, pledging to become patrons of a sports club. And, like FixMyStreet, we sold Pledgebank as white-label software for councils, allowing them to organise, for example, community snow clearance, and Royal Wedding street parties. Here at mySociety, we’re not all about making the big bucks. But that doesn’t stop us from occasionally wondering why we never evolved Pledgebank into a lucrative service like Kickstarter or Groupon, both of which are founded on the very same idea: that there’s potential power in a pledge. Whether you back a project on Kickstarter, or put in for a hot stone massage on Groupon, you’re basically undertaking to buy something. But while Pledgebank did allow fundraising pledges, it didn’t take a cut of the moneys raised. At one point we did look into using an escrow service, but we decided in the end that each pledge organiser could sort out collection of any payments. And thus, we never quite became Kickstarter. Oh well. Pledgebank might have been founded on a simple concept, but, like so many simple concepts, it turned out that there were endless features we could add to it. At launch, SMS text messages were an important part of the site, and one that we spent considerable time and effort on. It was 2005, remember, and as we often said in our blog posts at the time, many people either weren’t online or had no desire to be. We wanted the site to cater for them too. And almost immediately after launch we added another feature: the ability to subscribe, so you’d receive an email when someone set up a pledge that was near you, geographically. This was ideal for those pledges with a local aspect, such as saving an ancient tree, or getting together to clean up a community. Then there was the international aspect. Pledgebank was mySociety’s first in-house project to be translated. In true mySociety style, the translation was crowdsourced and ultimately overseen by our diligent volunteer Tim Morley. As I write, just prior to the site’s closure, it is available in 14 languages, from Simplified Chinese to Belarusian, and including Esperanto. And it was taken up, enthusiastically, in many countries. Even now, we still sometimes have to deploy Google Translate in order to reply to Pledgebank’s user support emails. Over its lifetime, Pledgebank has been the starting point for many people to make the world a better place, in ways both large and small. Before we say goodbye all together, let’s take a look at some of the surprising, sometimes amazing, things it helped bring about. In what was probably Pledgebank’s biggest success, over 1,000 people donated to bring about the creation of ‘an organisation that will campaign for digital rights in the UK’: that organisation became the Open Rights Group. After the Croydon riots, more than 1,000 people chipped in to rebuild the damaged Reeve’s furniture store. Football fans raised over £20,000 for Ebbsfleet United, so that they could buy striker Michael Gash. A pledge encouraging bloggers to post about women in technology on Ada Lovelace Day saw almost double the number of pledgers they’d hoped for. Australian massage therapists raised the funds to travel to New Orleans and offer therapy to those who needed it in the wake of Hurricane Katrina. People from all over the world donated books and money to build a library in Bhubaneswar, Orissa, India. 1,000 people pledged to move house and start a Free State community in New Hampshire. Hundreds of orphans in Liberia received clean underwear. Over £2,000 was given to plant trees in Kenya. A pianist played a free jazz concert at Guy’s Hospital, in return for others pledging to have the hospital’s piano tuned. 15 people engaged in earnest conversation with someone whose views they really despised, to try to understand them more. As noted in this BBC article on the site launch, several people buried a bucket to create a home for stag beetles. …and many more. Over time, Pledgebank became an archive of inspirational, utopian, and sometimes plain eccentric pledges. It brought thousands of people together in common causes, and multiplied the power of a single person’s desire to do good. We’d love to hear how you used Pledgebank: let us know in the comments below. We recently shared news of some substantial funding from Omidyar Network, and the goals which that funding will help us to achieve. Those goals are quite ambitious, and we’re going to have to focus hard on a number of core projects to meet them. Consequently, we’ve made the hard decision to let go of a few of our other sites; sites which need time and attention, but which won’t help us towards meeting those key aims. mySociety has built loads of websites during its time: it’s the way we’ve historically worked. When we started up, we just wanted to make cool civic sites that would do useful things; if we could get the funding, and someone was willing to build them, we’d go for it. All of the projects we launched were based on pretty sound ideas; all of them strove to empower people and open up democracy in one way or another. But, as we’ve become a more mature organisation, with responsibilities towards our partners and funders, that scattergun approach doesn’t fly any more. Running a website, no matter how small and self-sufficient it is, requires some investment, in terms of maintenance, user support, and updating, and sadly, right now we can’t maintain everything to a level that keeps it useful and functional for users. Over a decade since mySociety first started, some of those early sites have proved their worth. They’ve grown and matured with us. Here in the UK, our Freedom of Information site WhatDoTheyKnow has over 400,000 visitors a month, and sites like TheyWorkForYou, FixMyStreet and WriteToThem have become UK institutions in their own right. Alaveteli, the software which underpins WhatDoTheyKnow, has been adopted in 21 countries; the FixMyStreet Platform is being used in 11, with both set to increase as we concentrate on reaching out to international partners over the next few years. Additionally, we’ll be continuing to strengthen our international work with the Poplus federation, developing and supporting the use of Poplus Components and the Pombola platform. These projects are core to our Omidyar Network funding and the results we’ve promised to deliver from it. Along the way, though, there have been some projects which, for one reason or another, have not gained quite as much traction. You might say they were before their time: Pledgebank, for example, predates Groupon, Kickstarter and similar pledging concepts. In some cases, the world moved on: most MPs now have their own channels for contacting constituents online, so HearFromYourMP isn’t quite as vital. In others, we simply don’t have the necessary resources that the project needs: FixMyTransport is a good example of that. In February, Pledgebank will stop accepting new pledges, although users will still be able to sign up for existing ones until the end of June. We’ll be emailing all owners of pledges to let them know that the site will close at that time. From the 1st of March, you’ll no longer be able to create a report on FixMyTransport. If you are running an active campaign or problem report, we’ll email to let you know of the site’s closure, which is planned for the end of June. MPs can continue to use HearFromYourMP to send newsletters to their constituents, but we’ll be letting them know that the service will be retired before the General Election. In February, ScenicOrNot will be mothballed so that users can no longer rate photographs. We’ll be keeping the leaderboard intact and developers will still be able to use the site’s data. It’s not without regret that we’ll be saying goodbye to these sites – each and every one of them is based on a sound idea that fell well within mySociety’s remit to provide civic and democratic digital tools. Like most mySociety sites, the code of all of the above is Open Source and you are welcome to pick it up and adapt it to your needs. We’d be delighted if there was interest, from other individuals or groups, in running something similar, based on our code. 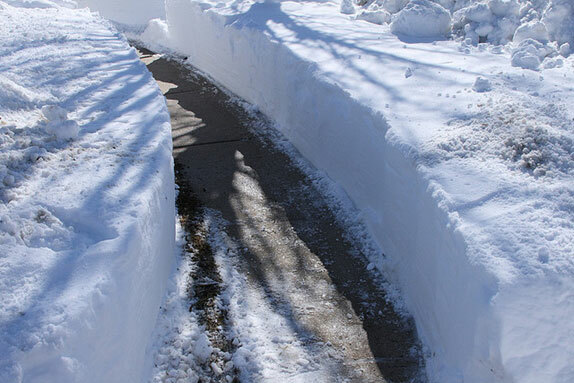 How do you get everyone working together when the community needs it most – like when there’s a heavy snowfall? Recently, we posted a conversation with Chris Palmer of Barnet Council, where he talked about integration of FixMyStreet with the council website. Barnet also use another mySociety tool – Pledgebank – and Chris explained how it helps them within the Barnet communities. “We took on Pledgebank in the belief that the council needs to get out of people’s way. Online communities are good at complaining about things: it’s easy to get instant outrage on the web, and actually we need mechanisms that allow people to get together creatively. “One of the issues we had during the heavy winter of 2010 was that people complained the council wasn’t coming round and clearing their paths. Well, the council never came round and cleared the pavement outside those particular houses. “Many people said, well if the council allowed us to, we would do it ourselves. Pledgebank allowed us to get parents at 25 schools to sign up last year. They pledged to come and spread grit and clear the snow from outside just in return for free shovels and a ton of grit. “That kind of thing encourages residents to be active, it frees them from the frustrations that the political system gives them. If people feel, ‘Oh, there’s a legal process stopping me doing this’, it moves the council forward, to being an enabler rather than a provider of services. “A parent can spend 15 minutes in the morning and then be confident their child will be at school for the day and that they can go off to work, so for the parents, it’s win-win. “One of the things that surprised us was the response of local residents who live in the street but don’t necessarily have children at the school. They felt that they should be helping to clear the snow. It gave a group of active residents who we hadn’t even asked, a chance to be involved”. Why do you think that is? Is it just that people just want to contribute within their community? “I genuinely think people just aren’t interested in councils. I couldn’t tell you the name of my council leader where I live, never mind the name of cabinet members. However, I am very interested in the services the council provides: the only public meeting I’ve ever been to was about parking, because it directly affected my street. And I’d probably say there’s a rule, where people will take responsibility for the space outside their own house, and be prepared to extend that a few houses either side. And this just gives people a mechanism to be involved in their local community. “With Pledgebank, we can leave people to do things amongst themselves, with the understanding that the council is not just a provider of services, but a catalyst to people doing those things themselves”. What else have you done with Pledgebank? “We’re hoping residents will play a part in keeping their streets tidy with our Adopt-a-Street scheme. There’s a real sense of ownership if somebody controls the green space outside their house: do they plant the bottom of trees in the street with wild flowers, do they plant bulbs in what’s currently a grass verge? We can give them that element of ownership, and give them control of their local environment. “So with Adopt-a-Street, we found one or two people locally with an interest in doing it, and we’re looking now at how we encourage them to leaflet their neighbours, get in contact with their neighbours. “It’s worth adding, though, that Pledgebank has taken us a lot of learning. It’s quite easy to imagine that anything you bung up on the web suddenly becomes viral: it doesn’t. “One of the challenges for us is how we link into what we’re doing, how we publicise what we’re doing with Pledgebank and the web. So we have to look at it not so much as, here’s an interesting web device, but here’s a device that enables residents to do things. But the council has a responsibility to publicise it. “The key challenge for us is making information available to the relevant people. It’s all about defining communities, and making information available to those communities – and mySociety has been tremendously helpful with that. Barnet have been inventive with Pledgebank. As well as using it during the snows, they’ve managed street parties for the Jubilee and Royal Wedding; got volunteers to give IT training to residents; and encouraged visits to carehomes. If you’re from a council and you think Pledgebank might work for you, drop us a line to find out more. 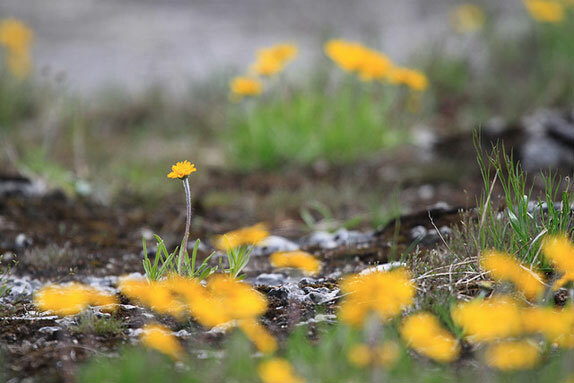 Image credits: Snow Big Dig by Shashi Bellamkonda, Lakeside Daisy by Matt MacGillivray, and Diamond Jubilee Street Party on Kenyon Clough by Dave Haygarth, all used with thanks under the Creative Commons licence. 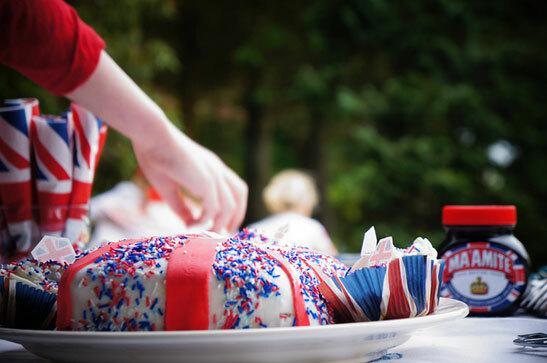 Being strictly non-partisan mySociety has no official view on Wills & Kate, but we are unashamedly Pro People Having Parties. And recently we’ve been able to work on a project with Barnet council that has helped us make more of them. Most councils want people to be able to have a street party if they want – I mean, who’s against a party? But closing a street has costs associated with it, and there’s no point in spending that money if the ‘Street Party Committee’ is actually just one person, and the party isn’t actually going to happen. Tackling this particular problem seemed ideally suited to PledgeBank, which exists solely to make sure there are enough people signed up to make a particular activity worthwhile. It is then the applicant’s task to get another couple of people (or more) to sign the pledge. Once the signers exceed the threshold, the council believes the party is bona fide and starts work. Simple. And it works! There are 24 parties currently listed that have passed the threshold, so that’s 24 streets that are already good to go. There are another 27 that may succeed or fail, depending on their organiser’s motivation. Strangely, though, our invitations haven’t arrived yet, but, you know… they probably got lost in the post (sniff). We’ve been doing some work with Barnet Borough Council recently, such as a nice planning alerts tool. Simple, useful, well built stuff that meets an obvious need – exactly the sort of stuff we’re keen to work on with all our clients. During our conversations with the officers at Barnet, it became apparent that one thing they were thinking about a lot was how to support all the people who want to have Royal Wedding street parties. The dilemma was pretty simple: they want people to have a good time, but each street party means closing a street to traffic and doing other things that take time and money. And this isn’t worth doing if it turns out the people on the street weren’t really up for it anyway. 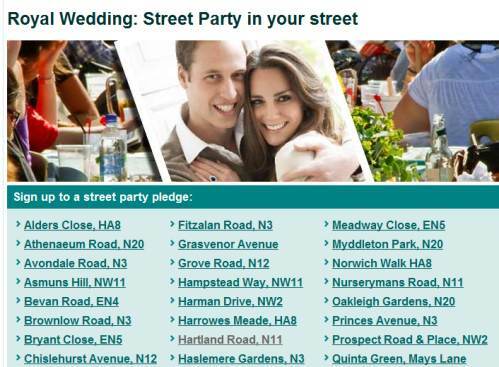 Reducing a risk like this sounded like exactly the sort of problem that PledgeBank was built to tackle, so we’ve customized it a bit for this specific purpose, added a big, cheesy picture of the happy couple, and launched Barnet’s Royal Wedding Street Party page. The mechanic is nice and simple – you tell the council who you are and what street you live on. They then send you a back link to a street-specific pledge that needs signing by people in three households. You pass this around your neighbours, get the signatures, and presto, Barnet will support your party. Lovingly built by mySociety’s Dave Whiteland, this might not exactly be the biggest story in local government history. However I do think it’s a nice and surprisingly rare example of developing a small bit of policy that aligns just so with a new bit of technology. It’s not trying to ram a square technology peg into a round policy hole. I hope we get to work on more things like this in future. In other words, volunteers make our organisation tick and thought it about time that we shed some light on who they are and what they do. First out being subject to closer scrutiny is Tim Morley who looks after the everyday running of PledgeBank.com. Tim has been volunteering for mySociety.org since 2005. Having heard about us through an article in the Guardian, he started out by translating content to Esperanto, and has through the years progressed to his current role. Being a trained primary school language teacher, Tim estimates that he spends anything from five minutes to 3-4 hours a day on his volunteering work depending on how much there is to do. Task varies from helping users with technical queries to help out organising events. Challenge was an initial motivating factor in deciding to start volunteering. He could also see the benefit of PledgeBank.com as a tool for the Esperanto speaking community, to help and encourage people to organise happenings in what is a very widely- and thinly-spread group. Three years later what keeps him going are the people involved with mySociety.org, the fact that he’s impressed with other things that we are doing and is proud to be associated with our organisation. Making a contribution and taking PledgeBank.com forward still feels important. 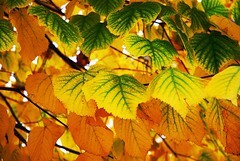 If you are interested in volunteering for mySociety.org don’t hesitate to get in touch. As can be seen above, Tim is a highly involved volunteer. But all contributions to the running of our organisation are appreciated so don’t let him put you off. :-)) Further info on some of our other volunteers is in the pipeline if you are looking for inspiration on how you can help out. This pledge helps kids in Ooty, India to broaden their horizons by providing books containing knowledge they would otherwise not have access to. Sirukathai, the organisation behind the pledge, believes that reading material outside the child’s usual textbooks helps opening up new worlds, develop thinking processes, aid communication, foster self confidence and create a better, more balanced and compassionate citizen. With two days to go before deadline, the getachild2read pledge has 205 people signed up to donate books. That’s five over target and there’s still time join if you wish to make a contribution! Kalyani, the man behind this worthy project, and his “aids” are already in the process of collecting and cataloguing items coming in. To some it seems that this is a most interesting task and not at all that laboursome :-)). A more thorough follow-up report is on the way so stay tuned. Ian has used PledgeBank to start a residents association for a new block of flats in Cambridge, UK. Unfortunately, I’ve had to disable the PledgeBank Facebook application. It used to let you sign and share pledges from within Facebook. Facebook recently changed their platform (again! ), breaking our code for sending success/failure messages. Obviously, it is no good signing up to a pledge if you don’t get informed when it succeeds. I tried to fix it, but couldn’t work out how to do so quickly. We don’t have the time and money at the moment to chase after this, so I’ve disabled the application entirely. Links to PledgeBank pages on Facebook now redirect to pledgebank.com. Hopefully it’ll be back one day – do send us emails if you miss it (or money if you have a large pledge that really needs it!). I think there may be a better solution with a simpler interface – the current application tried too hard to reimplement all of PledgeBank within Facebook. And besides, we should be supporting OpenSocial now it exists. It’s an open standard, Facebook isn’t. Technical details: We used infinite session keys to send notifications from cron jobs. Quite reasonably, this no longer works. However, I couldn’t find out what to use instead. I think Facebook should respect backwards compatibility of its APIs a lot more, and if it breaks it they should give clear instructions about what to use instead. This does put me off ever wanting to develop anything on their platform again. I’m enjoying the weather at the moment, seems to be sunnier than the summer, but cool with an atmospheric autumnal taste in the air. mySociety is changing as ever, leaping forward in our race to try and make it easier for normal people to influence, improve or replace functions of government. More on this as it happens. Meanwhile, I’ve been continuing to hack away at WhatDoTheyKnow. A little while ago Google decided to deep index all our pages – causing specific problems (I had to tell it to stop crawling the 117th page of similar requests to another request), and also ones from the extra attention. There have been quite a few problems to resolve with authority spam filters (see this FOI officer using the annotation function), and with subtle and detailed privacy issues (when does a comment become personal? if you made something public a while ago, and it is now a shared public resource, can you modify it or take it down?). Right, I’ve got to go and fix a bug to do with the Facebook PledgeBank app. It’s to do with infinite session keys, and how we send messages when a pledge has completed. Facebook seem to change their API without caring much that applications have to be altered to be compatible with it. This is OK if the Facebook application is your core job, but a pain when you just want your Facebook code to keep running as it did forever.